The preseason has come and gone, with it we saw potential new stars, rookies’ first action in the NFL and some outlandish individual performances. With rosters finalizing over the holiday weekend, it’s time to take a final look at the top performers over the course of the entire preseason. While this group is certainly represented by some of the NFL’s established elite, it is also made up of a number of intriguing young talents. The Chiefs may publicly be insisting Mahomes isn’t anywhere near Alex Smith’s current level, but if the rookie’s preseason play is any indication, Kansas City may get a much earlier return on it’s investment than expected. 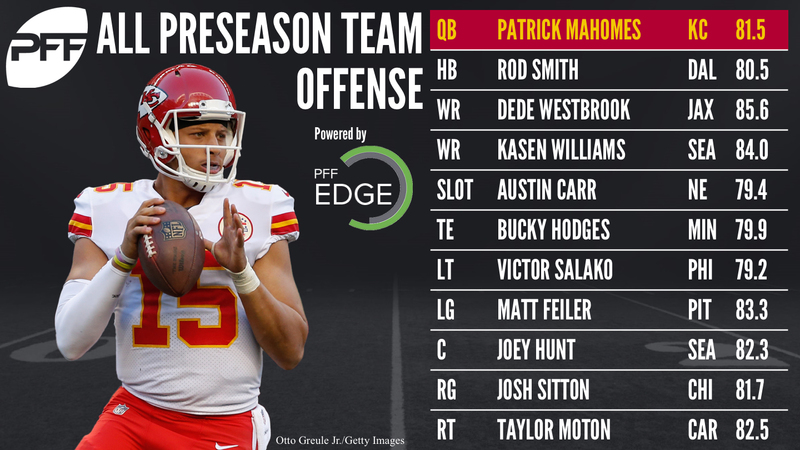 Mahomes showed off his elusiveness throughout preseason play, as he was sacked on just 8.0 percent of his dropbacks despite facing pressure 41.0 percent of the time, the seventh-highest mark. His 109.2 passer rating was the highest through four weeks, and his 67.9 completion percentage was fourth-best. Smith forced 11 missed tackles on 29 rushing attempts, helping him earn the highest elusive rating this preseason (126.4). Not surprisingly, his 3.79 yards after contact per attempt was second-best. Jaguars QBs had a rating of 157.1 when throwing to Westbrook, as he amassed 13 receptions for 288 yards and two scores on 17 targets. He also did not have a drop all preseason, and earned the second-most yards (139) on deep targets (throws that travel at least 20 yards through the air). The Seahawks presumably tried to stash Williams on their practice squad, but there was no hiding his performance on the field this preseason. He topped Westbrook on deep yards with 167 (on six grabs), and overall totaled 208 yards on nine grabs. Carr snared all 14 catchable targets thrown his way, and the 132.1 rating earned by Patriot quarterbacks targeting him this preseason was ninth-best among receivers with at least 10 targets. 51.8 percent of his routes were run through the slot, and half of his grabs came when aligned inside, yet the Patriots still elected not to keep him as part of the replacement plan to Julian Edelman. Hodges caught all four catchable balls thrown his way, amassing 72 yards and a score. The rookie also earned a solid 72.9 run blocking grade, and it was this balance to his game that secured him the highest tight end grade this preseason. Hodges survived the first wave of cuts only to be waived to make room for the Vikings to claim TE Blake Bell. Salako earned the top preseason overall grade at his position, thanks to a balanced performance on run and pass blocks. His run blocking grade of 80.2 ranked 13th among all tackles, and he did not give up a single pressure on 43 pass blocks. Feiler’s 84.0 run blocking grade was fifth-best among all guards this preseason, and his pass-blocking was outstanding. While he finally gave up his first sack against Carolina in Week 4, on 112 total pass block reps in August, he surrendered just three total pressures. Hunt’s 80.2 run blocking grade was certainly impressive, but it was his pass blocking that put him in the top spot at the position. He surrendered just one pressure, a hurry against Seattle in Week 2. The Seahawks released him, but he put down some good tape this preseason to help him catch on elsewhere. Sitton posted an impressive 84.8 run blocking grade in three appearances this preseason, third-best among all guards. Even better was his pass blocking, as he did not give up a single pressure in August. Moton played 21 snaps at left guard in Week 1, but spent the rest of the preseason at right tackle (151 snaps). In 99 total pass blocks, he yielded no sacks and just three total pressures, and also graded well on run blocks (76.3). Harris’ overall grade of 90.8 topped all players at all positions, as he was a dominant interior force for the Broncos throughout the preseason. He posted three sacks and a total of 12 QB pressures, and notched nine total defensive stops. Ringo’s run stop total wasn’t massive (two), but he did an excellent job of defeating blocks and changing the point of attack inside. His pass-rushing was excellent, however, as he tallied 11 total pressures, including four each in Weeks 1 and 4. Qualls’ play this preseason was too good not to include him among the league’s top defensive performers. He racked up two sacks and nine total pressures, and was even better against the run, where he posted five stops. Smith didn’t play in Week 4, but his early preseason dominance was too much to for the rest of the edge players to overcome. He managed a sack on limited snaps in Week 3, but in Weeks 1 and 2, he totaled 14 total pressures. Lynch posted five total defensive stops in three preseason games, two of them sacks in Week 1 against Kansas City. He posted 12 total pressures, and also batted down a pass at the line of scrimmage. Fort got extended looks in Weeks 1, 2 and 4, and was a tackling machine in all three. He notched 16 solo tackles, with 12 of them going for stops, and did not miss a single tackle. Evans posted eight run stops, the highest total among 4-3 outside linebackers. His run stop percentage of 20.0 percent was third-best at his position, and he also posted three additional stops in coverage. In 38 coverage snaps, Gaines was targeted just five times this preseason, and it’s easy to see why when looking at the results. He surrendered just one catch for six yards, while notching a pick and two break-ups. Quarterbacks had a rating of 0.0 when challenging his coverage in August. Williams gave up four catches on nine throws into his coverage, but combined they totaled just 23 yards. He racked up five total defensive stops to go with a pass break-up, and did not allow a touchdown. 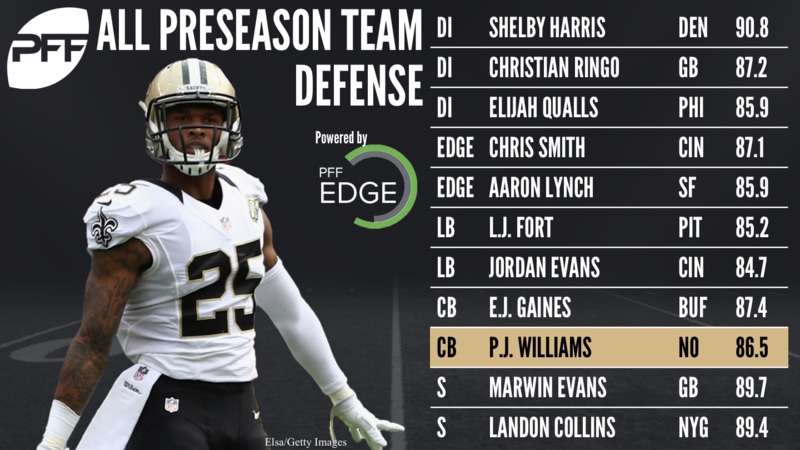 Evans played a whopping 169 total snaps this preseason, and was a force against both the run and pass. He notched seven total stops and tallied a pick and two pass break-ups while allowing a passer rating into his coverage of just 37.5. If the preseason is any indication, Collins is set for an impressive encore performance to his breakout campaign of 2016. He allowed just 11 receiving yards on four catches into his coverage, and notched a pick while surrendering a passer rating against of 22.6. 10 was the magic number for McManus, as he booted 10 touchbacks in the preseason to go with a perfect 10-for-10 mark on field goals. His kicking duties weren’t limited to chip shots either, as five were kick between 40 and 49 yards, and two of them were over 50. Koch’s net average of 45.5 yards per punt was the best in the league this preseason, and his 46.9-yard average was eighth-best. Most impressive is the fact nine of his 11 punts were inside the 20 (with no touchbacks), and the only three returned punts netted the opposition just 16 yards. Bolden returned just one punt (in Week 4), but made it count be returning it 92 yards for a score. He also scored on a kick return (104 yards), and average 34.4 yards on eight returns.